Looking for a 1998-2002 camaro or TA. Looking for a manual transmission, less then 100k miles, hard top or T-top. No rust, clean title. Mildly built cruiser/daily driver. (H/c/I). No convertibles. Closer to NC the better. Would like to be around 8k but somewhat flexible depending upon vehicle. Not my photo, photo for attention. 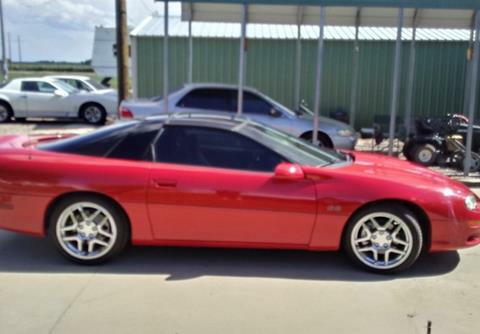 I got a red 1998 Z28 with a built 383 LS1 but MTI back in the day, only 10,000 miles on the motor build. I will be getting ready to sell my black 2002 TA WS6 very soon (it's not even listed yet). It is a 6 spd, and is a basic bolt-on car. However, 2 problems from your listing. #1, I am near Chicago IL (not exactly close) and #2, my car has almost 118k miles on it, slightly above your max. I will be asking $8,500. Biggest thing on the car is probably the strange s60 rear end with 4.10 gears, which just had all the bearings replaced in it. I can provide you a lot more info if you are interested, so just PM me.